Tonight's dinner was a delectable crispy pork chop made with Shake 'n Bake, served with sides of roasted onions, carrots, and sweet potatoes. I thawed out a 10 oz. bone-in pork chop, and coated it with a layer of Dijon mustard before coating it with Shake n' Bake original flavor bread crumbs for pork. I then chopped up an onion, two carrots, and 3 sweet potatoes as vegetable sides for two. I tossed the onions and carrots in canola oil, salt, pepper, onion powder and garlic powder. The sweet potatoes I tossed separately in canola oil with a little bit of white sugar. Then I baked the pork chops and the veggies in the oven at 375 degrees F for about 35 minutes, just until the pork was done and the vegetables were tender. The mustard on the pork kept part of the crumb coating soggy, but other parts were crispy. My boyfriend made one without mustard coating, and his came out crispy all over, which was also nice. 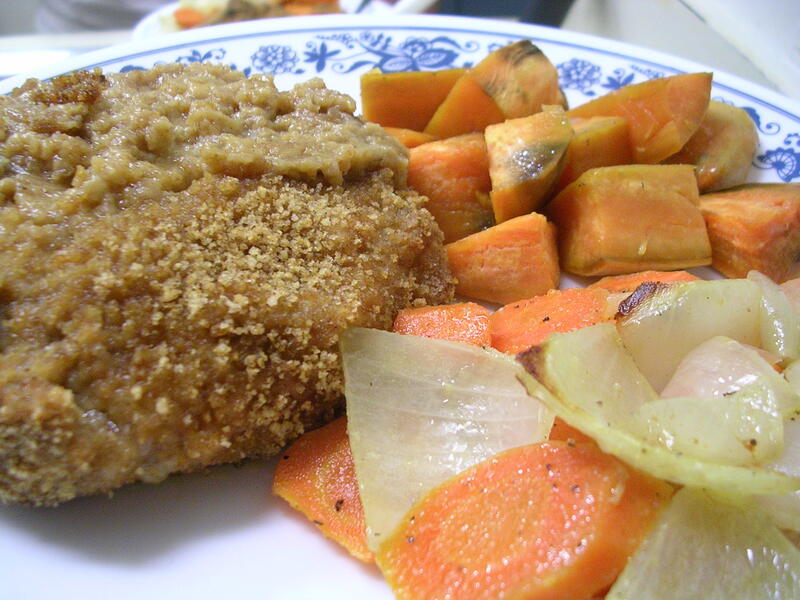 The flavor of the pork chops was amazing; they were juicy and the bread crumb coating was savory, and it paired perfectly with the natural sweetness of the vegetables we used. This entry was posted on Wednesday, October 24th, 2007 at 8:34 am	and posted in American, cooking, Uncategorized. You can follow any responses to this entry through the RSS 2.0 feed.